You'll be £12.99 closer to your next £10.00 credit when you purchase Chelmsford in the Great War. What's this? By the end of the Great War in 1918, 1,791 Chelmsford men were serving in the army or navy. Three hundred and ninety two of them did not return. Chelmsford in the Great War is the touching story of the people these men left behind: the munitions workers, special constables, VADs, shopkeepers, magistrates, councillors, conscientious objectors, teachers and school children, as well as Mr and Mrs Nathan Smith's St Bernard dog, Brenda, who collected funds for the British Red Cross. It is also an account of how this optimistic and modern town responded after the outbreak of war in 1914. Army camps and airfields appeared in and around Chelmsford and thousands of men of the South Midland Divisions and the Lowland Division were billeted here during their training for the front line. They had an immense impact on the people and despite the local attachment to the Essex Regiment, friendships were formed with the men with strange accents which lasted long after the war. The great local firms such as Marconi's and Hoffmann's were taken over for munitions work and the constant demand for skilled labour conflicted with the national need for fighting men. With the arrival of conscription the local military tribunal was hard pressed to find the right balance, until the place of women in the workforce was recognised. Civic affairs were dominated by a cohort of aldermen and councillors who seemed incapable of leadership in these turbulent times; with billeting, air raids, the blackout, food shortages, rationing and even the genuine threat of invasion the main concerns of the Chelmsford community, the Council responded by forming endless committees and subcommittees. Despite this, Chelmsford survived the war intact, undamaged, and indeed enhanced, and justifiably proud of its solid, if understated, contribution to the nation's monumental war effort. Overall, this is a fine example of the current spate of local histories about the First World War. Part of the excellent 'Your Towns and Cities in the Great War' series, this volume tells the story of the 1,791 men who served and the 392 who fell serving their country. It tells too of those left behind on the home front, the munitions workers, special constables, VAD's, local people from all walks of life and even Brenda, the St Bernard, who collected funds for the British Red Cross. Thousands of men were billeted in and around the town during the war and this is their story. 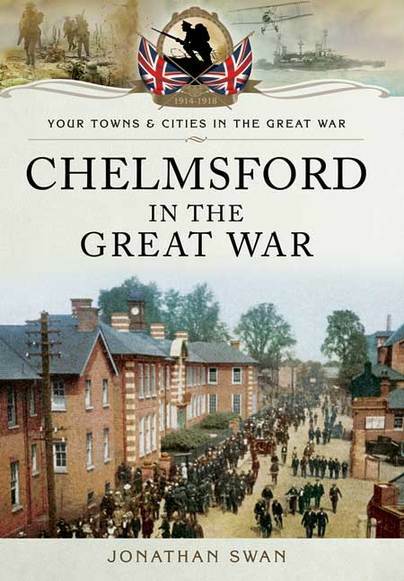 Chelmsford in the Great War is one of the books in this fascinating series... Someone with a personal interest in Chelmsford and local history will no doubt find this particular title invaluable, but as a study of social history this book and indeed this new series has wider reach and importance. A smashing introduction to the Home Front. Tells tales from the outbreak of war, air raids, makeshift hospitals, of conscientious objectors and even minor celebrity Brenda - the fundraising dog.